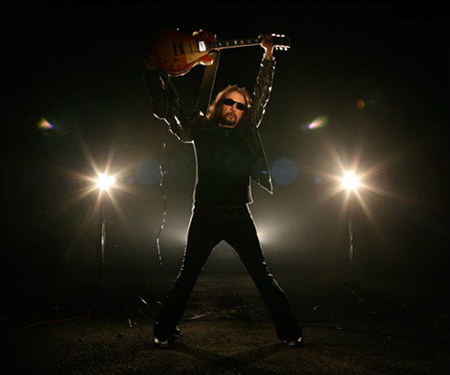 Ace Frehley is finally ready to add a new exclamation point to his celebrated career. For the first time in nearly 20 years, the legendary guitarist has concocted an explosive new solo effort. Flaunting fiery riffs, pristine production and jaw-dropping craftsmanship, Anomaly, on Frehley’s own Bronx Born Records, ties together the original KISS axeman’s trailblazing past, present and future. Scheduled for liftoff on September 15, Frehley’s fifth solo album—following 1978’s self-titled classic, 1987’s Frehley’s Comet, 1988’s Second Sighting and 1989’s Trouble Walkin’—will be distributed by Sony/Red with Rocket Science providing a full label service platform. To commemorate the event, Gibson has created their second Ace Frehley signature Les Paul guitar—the first one (in 1997) was one of the best-selling signature models of all time. Tell me about how you originally got into your craft, Ace. I come from a musical family and by following my brother and my sister, I picked up the guitar, and my life changed after I discovered the Beatles and the Stones. It’s straight ahead rock and roll. That’s what I originally loved to play when I was a kid. And nothing has changed after all these years. I love working on my apple laptop. If I wasn’t a musician, I would be a computer graphics artist. I’m currently working on a program called carrera which enables me to put my computer graphics in motion and create mini movies. I can spend hours doing that. Doing these interviews. (Laughs) Sometimes they get very repetitious. But that’s ok. As I get older, I like to connect with my fans more than I used to. The travel can be a bit tedious as well. I always knew I was going to be a rock star. Well, I’m from the Bronx in New York. Growing up there made me street smart and very realistic outlook on life. Being a New Yorker gives me a great sense of pride. I wouldn’t want to be from anywhere else. My biggest inspiration has to be Jimi Hendrix, possibly the greatest guitar player who ever lived. Not many people know this but I once roadied for Jimi at a Randall’s Island music festival in the 60s. I used to carry The Jimi Hendrix experience vinyl record under my arm at school every day. Right now, it’s the release of my newest record, Anomaly. The first one in 20 years (laughs.) I’m gearing up for a world tour, and I’m excited to see my fans. They’ve been very patient. I feel that I have the greatest fans in the world – I’m a lucky guy. If you're in the West Hollywood area be sure to catch Ace Frehley at The Viper Room September 12th at 9PM. You can also pick up his long-awaited release Anomaly starting September 15th, available for pre-order now at Amazon.